Team from the 2015 course in the field in Bangladesh to film a documentary to counter extremism. Every Wednesday evening for 15 weeks starting in April 2015, UC San Diego alumnus Robert Hooper (B.A. ’69) taught a class from a conference room in the Qualcomm Institute on the UC San Diego campus, just as he had done in 2014. 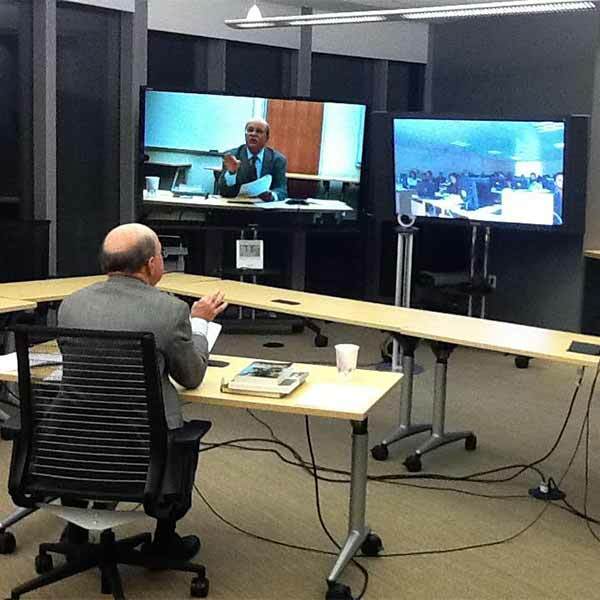 But instead of teaching students in-person in San Diego, Hooper tutored and mentored students from five universities in Bangladesh over a two-way, interactive Internet videoconferencing link that piggybacked on the Qualcomm Institute’s advanced teleconferencing network. Hooper teaches from a conference room in the Qualcomm Institute. 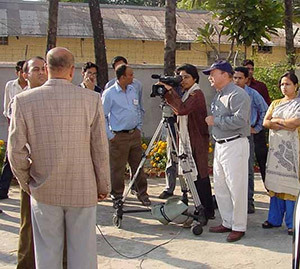 Robert Hooper (in blue cap) trains Bangladeshi journalists and filmmakers. 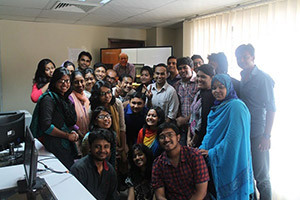 The two-year grant for “Filmmaking and TV Journalism for Peace and Tolerance in Bangladesh” kicked off in 2014 with 26 students, and a similar number completed the program in 2015. In both years, students teamed up to produce five documentaries or dramatic films. The AIUB film, “Bihari Camp”, tackled the history of impoverished Muslims from the Indian state of Bihar who emigrated to East Pakistan after Partition and long before the area gained its independence from Pakistan in 1971 as Bangladesh. The film recounts life in the present-day Bihari community, while also pointing to constructive improvements in that community since a 2008 law gave most Biharis full citizenship rights – ending decades as refugees. Another film, “The Guilt”, produced by students from Rajashahi University, dramatized the strikes and political unrest that rocked Bangladesh in February 2015, when activists began throwing petrol bombs at public transportation. Students enrolled in the 2014 course at Independent University, Bangladesh, with Robert Hooper on-screen from the Qualcomm Institute at UC San Diego. For the distance course, Hooper began webcasting his seminars and workshops at 7pm San Diego time to teach a morning course that began at 9am local time in Dhaka. Hooper and his co-instructors at IUB (including reporters, editors, producers and directors of photography) taught students how to write, shoot and edit their own documentary and dramatic films. “Professional TV production equipment and accessories were employed simultaneously in both the IUB and UC San Diego classrooms for a truly live, virtual experience,” explained Hooper. The Bangladesh program did not end with graduation on July 31, 2015. Ten of the best students in Year 2 were selected to attend UC San Diego during the Fall 2015 quarter (through GPS’s Global Leadership Institute). The State Department grant similarly funded stays at UC San Diego for ten students in Fall 2014, bringing to 20 the total number of Bangladeshi students exposed to the San Diego campus under the two-year grant. The long-distance course grew out of a project between 2003 and 2006, when Hooper spent time in Bangladesh teaching workshops and TV journalism courses in Dhaka and Chittagong. While training journalists as well as aspiring reporters and producers at the National Press Institute in 2005, Hooper’s visit coincided with a wave of terrorist bombings – convincing him to reframe the course as a way to introduce the role of journalism in fighting extremism. “We’ve achieved a groundbreaking new model to promote tolerance and counter extremism through filmmaking,” said Hooper. Hooper trains Kurdish media in Erbil, Iraq, in 2008. Hooper has witnessed firsthand the role of media in conflict resolution, terrorism and human rights and has done extensive on-the-ground research. In 2008, he was deployed to train journalists and news crews in northern Iraq from the relative safety of the Kurdish city of Erbil (relative to Baghdad and most other cities in Iraq, where 130 journalists had died in the previous five years). Hooper has also trained journalists in Indonesia, Malaysia, Bangladesh, Laos, Papua New Guinea, Slovakia and Vanuatu, and served as a Fulbright Senior Scholar to Malaysia (1989), Indonesia (2001), and Fiji (1994). More recently, he served as the UC San Diego project director for “Promoting Independent and Free Media in Fiji,” with a two-year grant from the State Department’s Bureau of Democracy, Human Rights and Labor.